Last week I traveled to NYC for work – we had a media tour with our new spokesperson Robin Miller from the Food Network. It was so much fun! I had never been into the city, only flown in and out of JFK and La Guardia. We stayed at the Gansevoort Hotel, which apparently is a hot spot for celebrity spotting. The only celeb we spotted was John McEnroe at dinner on Monday night. He didn’t yell at anyone or throw anything though. The absolute best part of the trip was on Wednesday. If you don’t know, I am a HUGE fan of cupcakes, especially Magnolia Cupcakes! In our whirlwind trip, we did not have time to swing by the actual bakery which was sad but expected. However, despite our super early start to the day, Lindsay and Kathryn were able to pull some strings and get Magnolia Cupcakes delivered!!! Lindsay made up this big story about how she had a super swank celeb with her and couldn’t reveal who but they REALLY wanted some cupcakes stat. Clearly they knew she was making the whole story up because when they were delivered, the note was signed: To Suri Cruise, with LOVE, the Gossip Girls! It was too funny and we all got a good laugh and a super sugar high – both much needed for such a long day. 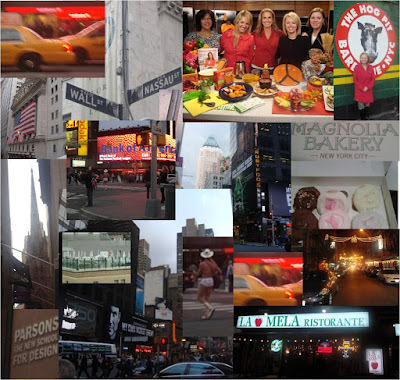 I loved NYC! I get to go back in just about 5 weeks as The Turkey Hill Social Club Girls will embark on our first annual THSC Girls trips! I can’t wait!!! That’s so funny about the cupcakes! Too funny! I was working in NYC last week too! I saw Adam Sandler and what’s his face from Dawson’s Creek (weak?) and Ondine from Top Design (totally weak. ).